I am making the effort to learn Vim. I know you can turn off auto indent but I can't get it to work because I have some other settings conflicting or something (which look pretty obvious in my .vimrc but don't seem to matter when I take them out). To turn off autoindent when you paste code, there's a special "paste" mode. Then paste your code. Note that the text in the tooltip now says -- INSERT (paste) --. After you pasted your code, turn off the paste-mode, so that auto-indenting when you type works correctly again. A useful command to have in your .vimrc is set pastetoggle=<F10> or some other button, to easily toggle between paste and nopaste. I usually use :r! cat and then paste ( shift + insert ) the content, and CTRL+D. No need to enable & disable, direct usage. This is a proper vim command, so no need to worry about entering an insert mode or switching off autoindent first. Of course if you are working remotely (console over SSH, for example) then this won't work and you should go the :set noai, insert mode, paste into console, leave insertmode, :set ai route as described elsewhere. While setting the paste mode with paste/nopaste/pastetoggle is perfectly fine, you still have to manually enable paste mode before pasting and disable paste mode after pasting. Being the lazy person that I am, below is the best solution that I've found so far, which automatically toggles the paste mode when you paste. Now you can paste without explicitly turning paste mode on/off - it is handled automatically for you. Note: This solution doesn't work in WSL (Windows 10 Subsystem for Linux). If anyone has a solution for WSL, please update this answer or add it in the comments. Here is a post by someone who figured out how to remap the paste event to automatically turn paste mode on and then back off. Works for me in tmux/iTerm on MacOSX. I just put set clipboard=unnamed in my .vimrc. That makes the default paste buffer map to X's clipboard. So, if I mark a bit of text in a terminal, I can simply press p to paste it in vim. Similarly, I can yank things in vim (e.g. YY to yank the current line into the buffer) and middle click in any window to paste it. Dunno. I find it super convenient. When working inside a terminal the vim-bracketed-paste vim plugin will automatically handle pastes without needing any keystrokes before or after the paste. It works by detecting bracketed paste mode which is an escape sequence sent by "modern" x-term compatible terminals like iTerm2, gnome-terminal, and other terminals using libvte. As an added bonus it works also for tmux sessions. I am using it successfully with iTerm2 on a Mac connecting to a linux server and using tmux. Edit: on reflection, :r !cat is a far better approach since it's short, semantic, and requires no custom vimrc. Use that instead! Note that there is only a distinction between "* and "+ for X11 systems. There are three documented X selections: PRIMARY (which is expected to represent the current visual selection - as in Vim's Visual mode), SECONDARY (which is ill-defined) and CLIPBOARD (which is expected to be used for cut, copy and paste operations). Of these three, Vim uses PRIMARY when reading and writing the "* register (hence when the X11 selections are available, Vim sets a default value for 'clipboard' of "autoselect"), and CLIPBOARD when reading and writing the "+ register. Vim does not access the SECONDARY selection. Select an URL in Visual mode in Vim. Go to your browser and click the middle mouse button in the URL text field. The selected text will be inserted (hopefully!). Note: in Firefox you can set the middlemouse.contentLoadURL preference to true in about:config, then the selected URL will be used when pressing middle mouse button in most places in the window. Select some text in your browser by dragging with the mouse. 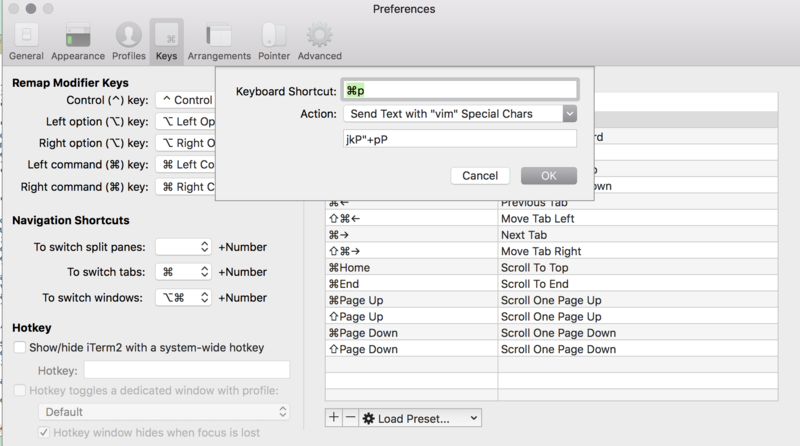 Go to Vim and press the middle mouse button: The selected text is inserted. Select some text in Vim and do "+y. Go to your browser, select some text in a textfield by dragging with the mouse. Now use the right mouse button and select "Paste" from the popup menu. The selected text is overwritten by the text from Vim. Note that the text in the "+ register remains available when making a Visual selection, which makes other text available in the "* register. That allows overwriting selected text. If you are on a mac, macvim seems to handle it well without having to toggle paste. A toggle has not been provided for 'paste' because the typical use case of wrapping of a solitary insertion is so wasteful: You toggle twice, but you only paste once (YOPO). Instead, press yo or yO to invoke o or O with 'paste' already set. Leaving insert mode sets 'nopaste' automatically. Another way to paste is via <CR> and dropping the contents of the register (here the global register). See: :h i_ctrl-r and h i_CTRL-R_CTRL-O. So to paste contents into vim without auto indent, use <CR><CO>* in most unix systems. Note: this only works if vim is compiled with clipboard. Sadly I found the vim plugin mentioned not to be working with iTerm2 3.0.15 (to be fair I don't know if this broke on older versions) - but I found this hack instead. Map command-p to do the paste and using iTerm2 vim keys. Obviously this only works for iTerm2. Then it just invokes P to enter paste mode, "+p to paste from the clipboard and then P to disable paste mode. hth. Not the answer you're looking for? Browse other questions tagged vim configuration editor indentation auto-indent or ask your own question. How to keep original program format when copying to vim? How do I remove the first character in N lines in vim? Vim Python indentation not working?